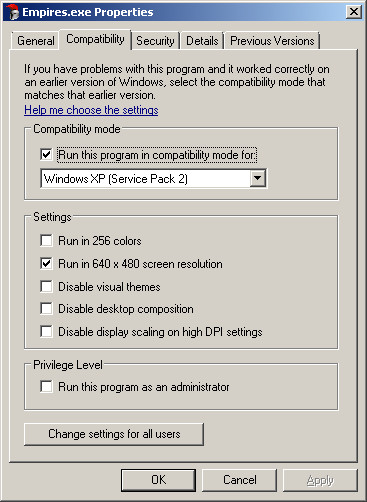 In Windows 7 SP1 x64 Ultimate when running a program I can select some option for compatibility's sake. I can run the program in 640X480 resolution, as shown below. Is there any way to run a program in a custom resolution? You could install a third party command line tool for changing screen resolutions like NirCmd (I've never used it but it sounds cool), and then add a resolution change command to the desktop shortcut you use to launch your program. Of course once the program closes you'll still have the new resolution running, and will have to manually change it back. You will need to substite the C:\Windows\System32\notepad.exe part for the location of the .exe file for the program the shortcut opens, and 1024 768 for the resolution you want. A couple times in the past I have used DisplayChanger to accomplish this task. Used it for some older games for the kids. You basically configure and EXE to run at a certain resolution while it is running. When execution is complete your main resolution is returned to normal. Note that this changes the resolution for everything and changes it back. Saves you the effort of manually setting it all the time. Certain applications can handle this natively. When they don't I used the above program. Unfortunately, this is not possible in the Compatibility Settings. The only way to do it is to manually adjust your screen resolution before opening the game. Not the answer you're looking for? Browse other questions tagged windows-7 resolution or ask your own question. Change display resolution and do full screen for apps from Windows 7 XP Mode? Is there any software to automatically change or save the resolutions for my 22“ and 19” monitors when playing the same game? Setting laptop built-in display's resolution below 1024x768?